Make ordinary documents look brilliant. Offers full-color and monochrome print speeds of 37 pages per minute. Rip through files faster with the high-performance 600MHz CPU and vast megabytes of memory. Get full-color first prints in as little as 15 seconds. Maximize uptime and ease of use with long-lasting supplies designed for quick and clean replacement, plus an angled 4-line LCD that displays system and consumable status at a glance. Produce vibrant color output and crisp text at true 1200 x 1200 dpi resolution for superior results. Optimize output quality for every job with advanced color calibration, ink simulation, and PANTONEcolor matching support. Install up to three optional 550-Sheet Paper Feed Units for a maximum 2,300-sheet capacity. Keep up to 5 different media sizes/types available at all times for unmatched flexibility. Adjust each paper tray for media sizes up to 8.5" x 14" with support for thick stocks up to 120 lb. Index. Duplex printing is supported up to 90 lb. Index. Use the 100-Sheet Bypass Tray for extra heavy stocks up to 140 lb. Index and special media like static cling paper, waterproof/coated papers, and banners up to 8.5" x 49" long. Restrict device access, set volume limits, and track printer usage for up to 500 individual users. 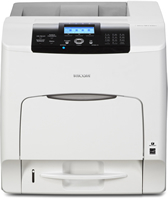 Use the 80 GB Hard Disk Drive (optional) to enable advanced features like Locked Print, Stored Print, and Hold Print. Letter, Legal, Executive, Half letter, A4, A5, A6, B5, B6, F, Foolscap, Folio, Envelopes: Com10/Monarch/C6/C5/DL, Custom: width 3.86" - 8.5", length 5.8" - 14"
*Installation requires the assistance of a technician. This product is under warranty against defects for a period of one year from the date of purchase. Consumables are under warranty for a period of 90 days from the date of purchase or until depleted, whichever comes first. Please refer to warranty documents shipped with the product for more details.